White women lost me the election! A full year and a half after her sinking in the 2016 Presidential election (thanks to Donald Trump’s collusion with Russia) Hillary Rodham Clinton still wants to explain to America why she lost. I am honored that she decided to sit down with me. MI: Good afternoon Mrs. Clinton. HRC: White women lost me the election. These housewife types who do whatever their husband tells them to do. And their white nationalist husbands told them to vote for Russia’s candidate. That’s why I lost! Deplorable white women and their alt-right white nationalist husbands! MI: White woman do what their white nationalist husbands tell them to do? HRC: Yes. If you look at the areas I won in the election I won the most forward thinking, progressive areas with the best economies. But the rest of America is nothing but filthy disgusting deplorables. MI: Gosh, with comments like that it’s a mystery why they didn’t vote for you. MI: Are you in any pain? HRC: No. Now where was I? Oh yes. I was talking about how much white people disgust me. HRC: Yes. But rich. That means I am better than most white people. 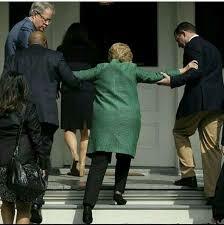 MI: Mrs. Clinton are you sure you’re okay? 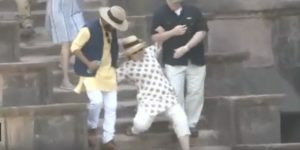 HRC: I told you I’m fine! Aide: [Perspiring and trembling] Water… one feet above the ankle. In the knee, in all three holds and in the boiler room six. MI: When can I continue my interview with Mrs. Clinton? Aide: That’s five compartments! Hillary Rodham Clinton can stay afloat with the first four compartments breached, but not five! MI: What are you saying? Aide: As she goes down by the head, the water will spill over the tops of the bulkheads at E deck from one to the next. Back and back. There’s no stopping it. Aide: The pumps buy you time, but minutes only. From this moment, no matter what we do, Hillary Rodham Clinton will founder. MI: But she can’t sink! HRC: Yeah. I can’t sink! Aide: She’s made of iron, Manhattan Infidel! I assure you, she can… and she will. It is a mathematical certainty. In an hour or so, Hillary Rodham Clinton will be lost forever. MI: Well that was odd. How could Mrs. Clinton sink? She was made with the most modern designs and material. And so ended my interview with the now-lost Hillary Rodham Clinton. One day perhaps we may have the technology to discover and explore her wreck. And build better robots.